Study suggests that Alzheimer’s can be detected before the onset of symptoms. One of the greatest difficulties plaguing efforts to find effective treatments for Alzheimer’s is the enormous lag between the disease’s inception and the appearance of clinical symptoms, according to Paul Coleman, an Alzheimer’s researcher at the ASU-Banner Neurodegenerative Disease Research Center. In addition to the ASU-Banner Neurodegenerative Disease Research Center, study collaborators include ASU, the Mayo Clinic, University of Rochester, Banner Alzheimer Institute and Barrow Neurological Institute. The new method successfully distinguished between Alzheimer’s, Parkinson’s and healthy controls, indicating that the test does not simply identify general phenomena of neurodegeneration but is able to pick out Alzheimer’s disease from other degenerative brain conditions. The method accomplishes this feat by examining white blood cells, or leukocytes. Here, segments of RNA known as transcripts — derived from specific DNA genes — hold vital clues regarding health. Alzheimer’s disease continues its pitiless ascent. The illness afflicts 11 percent of those 65 or older, with the figure soaring to 45 percent for people older than 85. Current trends predict some 14 million Americans will be afflicted with the disease by midcentury at a cost of a trillion dollars. Alzheimer’s tears out its victim’s memory, reasoning capacity and personal identity, necessitating around-the-clock care before death eventually ensues. The crippling toll of the disease on patients, family and society at large makes it a global health crisis of frightening proportions. Given the vital need for a safe and reliable early diagnostic for Alzheimer’s, many previous efforts have taken aim at the problem. Ideally, such a method should be appropriate for primary-care settings, allowing a broad swath of the public to be accurately and regularly tested. Until now, however, efforts to develop a reliable early diagnostic for Alzheimer’s have run aground. Further, the accuracy of diagnosis even after the disease has entered its clinical phase remains poor. It has long been known that Alzheimer’s produces changes in the brain, which can stimulate genes relating to such conditions as stress and inflammation. Expression of these genes appears in the blood in the form of specific RNA transcripts. The diagnostic precision of the new test is significant. Existing diagnostic screening results for known Alzheimer’s disease cases (identified through clinical and neuropathological factors) showed diagnostic sensitivityIn medical diagnosis, sensitivity is the ability of a test to correctly identify those with the disease, known as the true positive rate, whereas specificity refers to the ability of the test to correctly identify those without the disease or the true negative rate. was between 71 percent and 87 percent while specificity ranged from 44 percent to 70 percent. Such diagnoses are typically conducted in specialized facilities devoted to the study of Alzheimer’s. As the authors note, the accuracy of standard diagnosis falls significantly in primary-care settings. The result is that Alzheimer’s is generally detected very late in the disease process, if it is correctly identified at all — a blueprint for treatment failure, because the illness has already irreparably damaged the brain. The high rate of misdiagnosis leads to frequently unnecessary and ineffective treatment. The study divides 177 blood and 27 postmortem brain samples into several groups, establishing that careful analysis of RNA transcripts in blood samples has the ability to distinguish early clinical Alzheimer’s disease, Parkinson’s disease and cognitively healthy patients. It can accurately identify those carrying two copies of the APOE4 gene — known to be a severe risk factor for developing Alzheimer’s. Transcript screening was also used to identify those at risk for future cognitive impairment due to having at least one direct relative with Alzheimer’s disease. The study reveals that both cDNA and RT-PCR methods managed to distinguish probable Alzheimer’s disease from normal controls with an accuracy of 93.8 percent, using just five RNA transcripts for the test. As the authors note, the blood test’s accuracy may be even higher as some of the “false positives” — healthy cases mischaracterized as Alzheimer’s — may be from subjects who are actually positive for pre-symptomatic manifestations of Alzheimer’s. The results demonstrate that multivariate analysis of transcripts in blood samples provide an accurate and minimally invasive strategy for diagnosis of Alzheimer’s and early detection of its risk. Further, the results were consistent with examination of the same transcripts identified in the post-mortem brains of subjectsThe brain samples, obtained through the Banner Sun Health Research Institute, were taken from a region known to be vulnerable to the most devastating effects of Alzheimer’s. with Alzheimer’s compared with those diagnosed with Parkinson’s disease and with normal controls. In addition to RNA transcripts linked with inflammation and stress, the study examines a series of epigenetic transcripts — RNA sequences that have undergone post-transcriptional modification. Results again found a strong correlation between the presence of these epigenetic markers and AD, implying they may also provide a compelling diagnostic tool. Future refinements should sharpen the method’s ability to accurately identify Alzheimer’s disease at an early stage — prior to the onset of clinical symptoms — in a primary-care setting, with just a simple blood extraction. Efforts to conduct long-term longitudinal studies and hunt for additional diagnostic transcripts should eventually be combined with testing of new therapeutics aimed at early intervention. Intriguingly, one or more of the many existing drugs for Alzheimer’s that have failed in clinical trials may actually succeed in slowing or arresting Alzheimer’s if they can be delivered early enough in the disease process. Further, trials for new drugs targeting at-risk patients can be ramped up significantly if a simple, non-invasive blood test can replace costly imaging like PET scan. Top image: In a new study, ASU-Banner Neurodegenerative Disease Research Center researcher Paul Coleman and his colleagues at ASU, Mayo Clinic, University of Rochester, Banner Alzheimer Institute and Barrow Neurological Institute describe a blood test to detect Alzheimer's disease at a pre-symptomatic state. 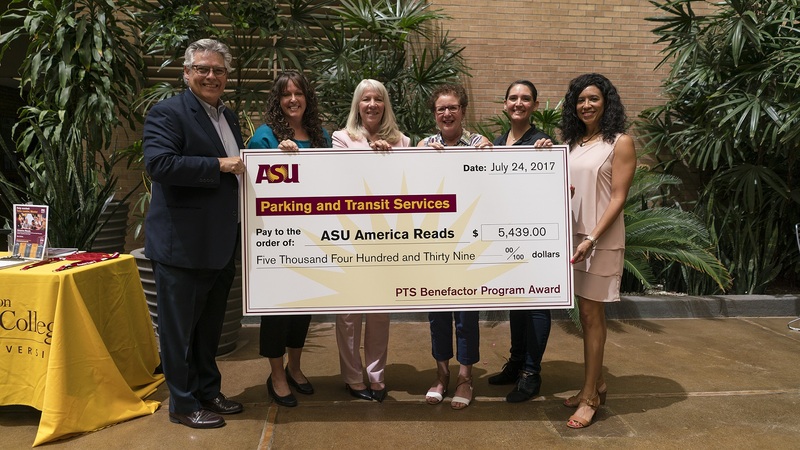 ASU Parking and Transit Services (PTS) presented ASU America Reads with a check for $5,439 on Aug. 18. The 2016-17 PTS Benefactor Program recipient received the check in a ceremony at the H.B. Farmer Education Building atrium. ASU America Reads, housed in the Mary Lou Fulton Teachers College, is an after-school academic program for economically disadvantaged children in grades K–8. ASU America Reads hires ASU students as tutors. Benefactor Program recipients are awarded funds at the end of every fiscal year. Current donations will support next year’s recipient, the Hispanic Mother Daughter Program — a middle and high school program to increase the number of first-generation Arizonans who are qualified to attend ASU through direct family involvement. Since 2012, PTS has donated more than $25,000 to Benefactor Program recipients. Past Benefactor Program beneficiaries include ASU’s American Dream Academy, Student Health Outreach for Wellness and the School of Art.